Paris recalled its ambassador in Rome to protest what it called baseless attacks. The fracas may hurt the countries’ ability to present a united front on revamping fiscal rules or bank reform. That would be a costly consequence of short-term electioneering before a European vote. 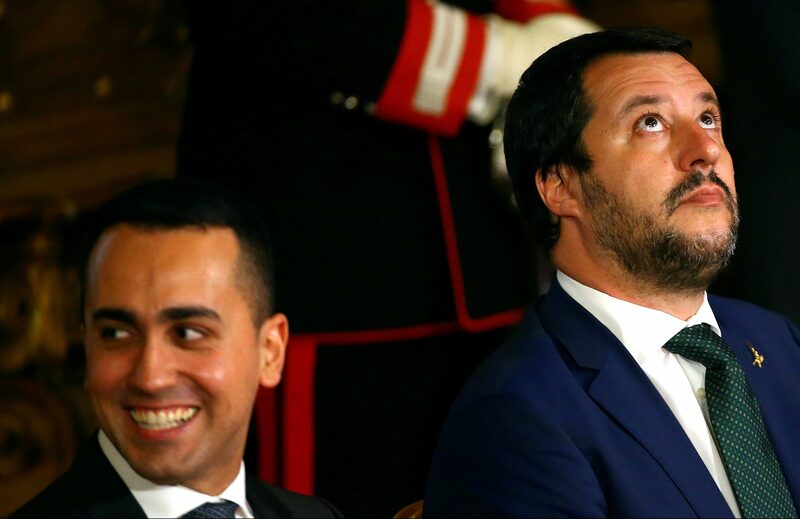 Interior Minister Matteo Salvini looks on next to Italy's Minister of Labour and Industry Luigi Di Maio at the Quirinal palace in Rome, Italy, June 1, 2018. France has recalled its ambassador in Rome, the French foreign ministry said on Feb. 7. Italy's two Deputy Prime Ministers, Matteo Salvini of the right-wing League and Luigi Di Maio of the anti-establishment 5-Star Movement, have in recent months goaded French President Emmanuel Macron on a number of issues, and Di Maio has met leaders of France's "yellow vest" anti-government movement.